If you've ever wanted to learn the art of hand mixing borosilicate color, now's your chance! In this DVD Suellen shares her method of adding metallic oxides to the inside of hollow tubing, melting them in and drawing out solid colored rod. Her formulas were the basis for developing the Northstar line of colors in the '80's. Her winged dragons are legend, and her hobnail patterned perfume bottles are inspiring. She also creates an Aurora vessel, which shows how to remix a reactive color with clear to create a multicolored swirling bottle. 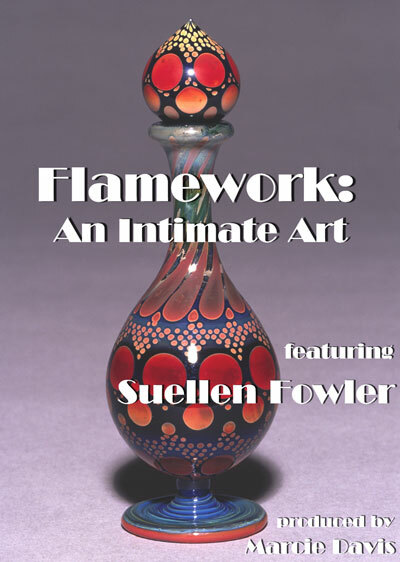 Listen to Suellen Fowler, Sharing the Chemistry of Color, a FREE Podcast! Want to watch right NOW? We offer VIDEO ON DEMAND. This is a separate service with it's own shopping cart. Click the button that shows ADD TO CART in FULL CAPS. This will take you to a second secure site for checkout. This will be an independent transaction and not added to your www.firelady.com shopping cart. Once you have completed your VIDEO ON DEMAND transaction, you'll need to manually come back to www.firelady.com to continue shopping here. A couple of extra clicks, but it allows you to watch the video right now and saves you the shipping as well! Happy Viewing!